I liked Grumperina’s so much I had to make myself a pair. 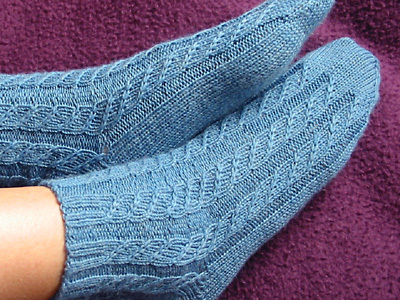 I mostly knit the pattern straight, except for doing 12 rows of ribbing at the top—I basically converted the middle stitch of each soon-to-be-cable-twist into a purl—making them ankle-length, and then doing a short-row heel. The finished socks are a wee bit short. I may wind up ripping out the toes and making them just a tad longer. Even so, I am zeroing in on the magical sock formula that will make socks that perfectly fit my feet. Tomorrow: New Year’s Knitting Resolutions! CogKnition posted this on January 1st, 2007 @ 10:53pm in Finished Objects, Socks & Slippers | Permalink to "Cable Twist Socks"